I think I am always writing about Decorators’ Colours—pink, lavender, aqua, (as I am sure everyone of you readers know, Benjamin Moore even has a Decorator’s White! ), but maybe I never write about one of my favourite colours of all, green. Green truly is the colour of Nature—here in South Florida, where it can be hot, hot, hot ! , green shade from leafy bowers and cool, tall trees, is what we are always seeking. And when we can’t find shade, we make it and cover it with greenery. 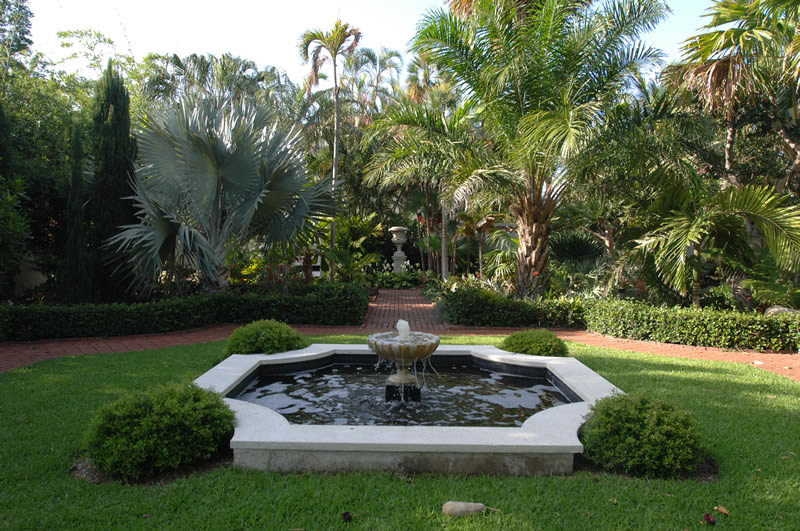 All of these pictures were taken in the Society of the Four Arts Garden in Palm Beach where you can see every shade of green imaginable, from the deep green of the water in ponds to the newest yellow greens of spring leaves (and variegated leaves all year long). 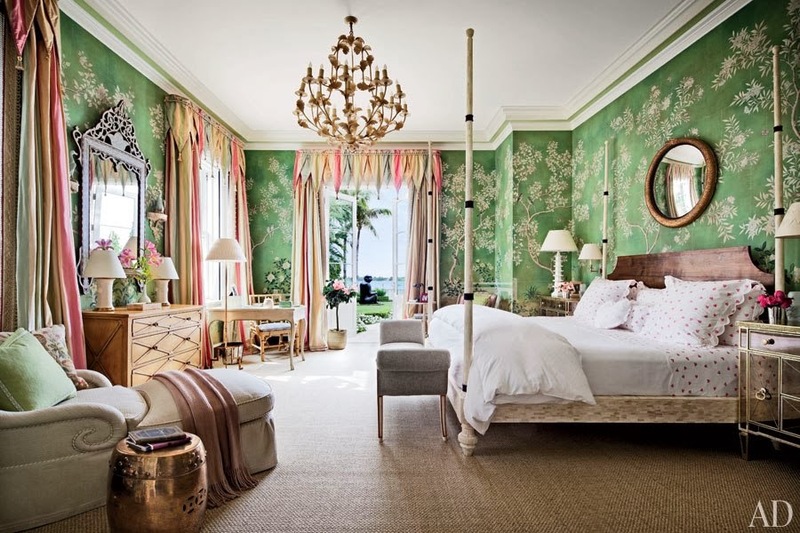 But, much as I love this spot—and I do and am always taking clients who are new to our area there, so as to show them the amazing diversity of South Florida—what I am talking about is green in decoration. Green is restful—use it on the walls as in this charming attic bedroom by Tom Scheerer. or a lot, the way Mario Buatta is doing here. Be bold with it, although I will hesitate and tell you right up front that this is genius-class decoration here from the great Mario Buatta. 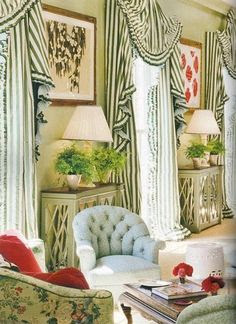 Just look at the play between the different greens and then the contrasting pale coral! You can be light with it as above or go for a darker, richer colour, and you will just not be wrong. 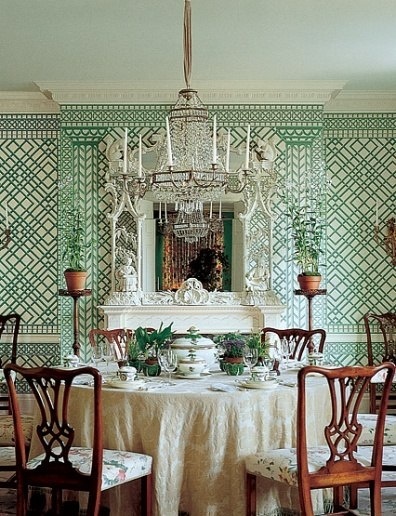 or Semi-serious as Mark Hampton did in this dining room. Or just go on, get serious, and paint the whole damn place green as the great Alberto Pinto did in this 18th century room in England. and even on the bed linens of this charming bedroom, which happens to have green woodwork, though you can hardly see it.